Navy Chic Style | Cosa Mi Metto??? With the hot summer sun grows the desire to dress in Navy Chic style. Personally I love this evergreen trend, so imagine my joy when I was asked to try a couple of the amazing bijoux created by Be Chic (you can discover more on Be Chic Pinterest page). I found the whole collection perfect for a bon-ton sailorette's look; every bijoux is unique, and has got a soul that captures the essence of the style it represents. The accessories I choose, as you can see by these pictures, are the "Corda Marine" bracelet, so romantic, with two little fishes kissing each other; and the "Navy Chanrms", one with the shape of a fish, the other depicting a cabin. Of course in nautical colors. I find them adorable! Do you like the outfit I decided to style up to emphasize these jewels? The others accessories complete this navy mood too.. The starfish bracelet from That's mine! and these amazing earrings are from the shop Angy Bijoux.Can't wait to know your opinions! Con il caldo sole estivo cresce il desiderio di vestirsi in stile Navy Chic. Personalmente amo questo trend evergreen, quindi immaginate la mia gioia quando mi è stato chiesto di provare una coppia di fantastici bijoux creati da Be Chic (potete scoprirne di più sulla pagina Pinterest di Be Chic). Ho trovato l'intera collezione perfetta per un look da marinaretta bon-ton; ogni bijoux è unico e rifinito in modo davvero perfetto ed ha un'anima che racchiude l'essenza dello stile che rappresenta. Gli accessori che ho scelto, come potete vedere dalle foto, sono il braccialetto "Corda Marine", così romantico, con due pesciolini che si baciano; e i "Navy Charms", uno con la forma di un pesce, e l'altro che raffigura una cabina. Ovviamente in colori nautici. Io li trovo adorabili!! Vi piace l'outfit con cui ho deciso di enfatizzare questi gioielli? Anche gli altri accessori completano il mood navy.. Il braccialetto con le stelle marine è di That's mine! e questi bellissimi orecchini sono del negozio Angy Bijoux. Non vedo l'ora di conoscere le vostre opinioni! 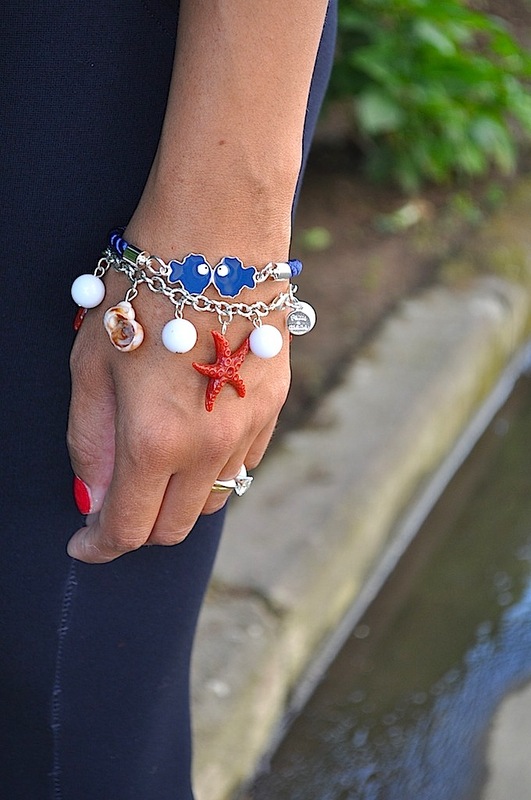 Be Chic "Corda Marine" bracelet and "Navy Charms"
Gli occhiali da sole sono fa-vo-lo-si!!! Bellissimi i braccialetti Be Chic! You look beautiful in this nautical look. So cute accessories. I love the look very nautical and the sunglasses are perfect ! adoro le righe e l'abbinamento blu/bianco!!! Un outfit impeccabile..e poi gli accessori sono veramente deliziosi e perfetti per questo stile..
Molto bello questo look! E i bijoux sono davvero graziosi! I braccialetti sono carinissimi cosi' come gli orecchini! Como me gustan tus gafas, estas bellisima. Spero visiterai il mio blog, ho un nuovo outfit! stupenda!! adoro il marchio be chic!!! Amazing outfit! Love your silver bracelet! So beautiful and summery! I love the stripes. Thank you for your comment. I would love your thoughts on my latest post! I so adore this outfit ! You have some lovely JEWELS! There's 3 items totally made in FRANCE to win if you enter my give away ;) it's very simple! Hi ya, thanks again for following my blog and leaving your lovely comment. Loving the nautical inspiration of this post! such a lovely look! love your earrings so much! Me encanta el look Navy que nos propones, estás muy guapa. Tutto molto carino, soprattutto gli orecchini! Stai benissimo!!! outfit estivo e chic, complimenti!!! Love your outfit, and sunglasses. The earrings are soo cute and I love the chanel bag! you look so cute, great earrings! Hello!Your blog are very interesting! You are nice! If you dont mind? lets follow each other! Thank you so much girls, how lovely you are? Grazie mille ragazze, quanto siete adorabili? I'am absolutely fan of these sunglasses ** I want the same xo your outfit is amazing and you are beautiful ! Sure, we could follow each other! Lovely glasses! So not boring!!! Love the nautical ensemble!! Thanks for stopping by my blog!! :) Following you on bloglovin now!! Follow back if you'd like! The kissing fishes bracelet is so adorable! Süper post.Following you please follow back now .I think you're wonderful girl.I like in İtaly.Bye. Süper si post.Following segui indietro. Penso che tu sia girl.Sorry google translate..